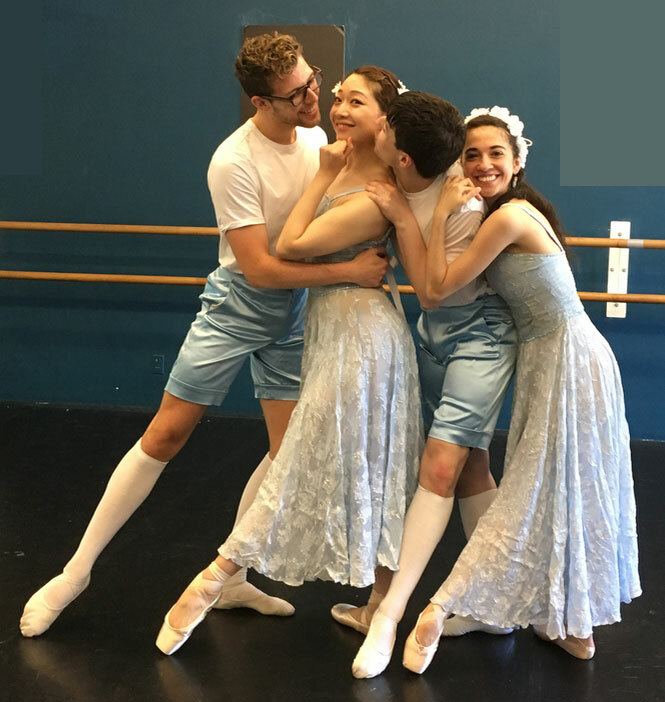 VANCOUVER, BC – Coastal City Ballet closes its 2017/18 season with the remount of Irene Schneider’s ballet, Shakespeare’s A Midsummer Night’s Dream, May 19 at Vancouver Playhouse and June 8 at Surrey Arts Centre. Set to the exquisite music of Felix Mendelssohn, this full-length ballet, which premiered in 2013, will showcase the talents of the Lower Mainland’s finest young dancers in their season finale. 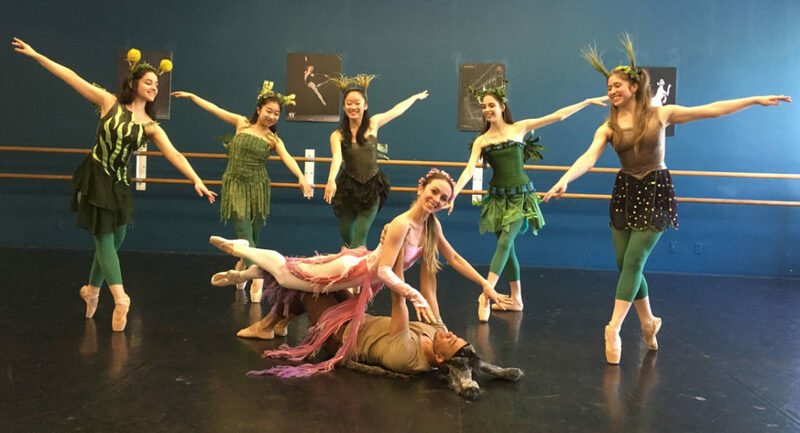 Commissioned from Schneider, former Artistic Director of Germany’s Magdeburg Ballet, A Midsummer Night’s Dream is one of more than 60 original dance works developed by the choreographer for ballet companies and opera houses around the world. Created for families and children of all ages, this adventurous performance features lavish sets, spritely costumes, and a delightful score. Coastal City Ballet is a repertory ballet company, based in Vancouver, that provides performance opportunities for emerging dancers, both Canadian and international. 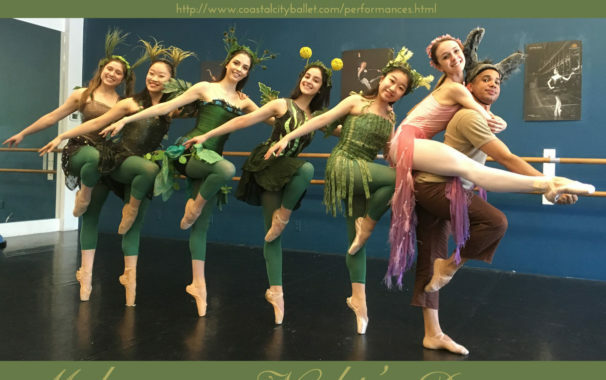 Coastal City Ballet’s repertoire ranges from original story ballets to classical and commissioned contemporary works by established international choreographers. 1956-1962 Studium Ballett und Tanzpädagogik Ballettfachschule Roleff-King, München, Hochschule für Musik und Tanz Mannheim und bei Nora Kiss und Victor Gsovsky, Paris. 1962-1973 Engagements am Nationaltheater Mannheim, Stuttgarter Ballett unter John Cranko und Frankfurter Ballett unter John Neumeier. 1973- 1977 Pädagogin an der John Cranko Akademie Stuttgart. 1992-2006 Ballettdirektorin und Chefchoreographin, Theater Magdeburg. 1993-2014 Leiterin der Theaterballettschule Magdeburg. Arbeit als Freie Choreographin am Theater Luzern, Schweiz, Theater Rostock, Theater Kiel, Theater Gießen, Fukuj und Kanazawa, Japan , Brasilia, Brasilien, Sofia, Bulgarien und Vancouver, Kanada. We’re currently looking for international participants from 50+ nationalities to join our drum circle in Vancouver on July 1, 2018, in celebration of Canada’s diverse culture and together setting a new Guinness World Record for “Most Nationalities in A Drum Circle.” It’d be awesome if you could please help us share the word with the German community! Please feel free to shoot me a message at register@canadadaydrumming.com if you have any questions. With the support from all regions, the celebration in Vancouver, BC, attempted a GUINNESS WORLD RECORDS™ title for “Most Nationalities in a Drum Circle” (single venue). While the attempt fell short of the requirement of 50 nationalities, it marked a special moment of unity and rhythm between the drummers representing 37 nations that participated. Canada, China, Australia, USA, United Kingdom, Syria, Mexico, Brazil and Bulgaria were some of the nations among the 37 nationalities represented in the drum circle. We thank everyone for coming out to the Canada 150 Atlantic to Pacific Celebration on Canada Day and hope you enjoyed all the energetic and loud drumming! Following the success of the 2017 Canada 150 Atlantic to Pacific Celebration, the Canada 150 Atlantic to Pacific Celebration committee is excited to announce the celebration will return to take place on Sunday, July 1st, 2018! We’re throwing the party again! Call for international drummers to celebrate #Canada‘s diverse culture with us this July 1 at #Vancouver‘s Creekside Park! And we need drummers from 5️⃣️ 0️⃣️+ nationalities to set the #GuinessWorldRecord for “Most Nationalities in A Drum Circle”! ‍♂️ ‍♀️ Previous drumming experience is not a must. Just show up at the rehearsals. 論 SIGN UP, but do it NOW cause the spots go fast. For most people who are familiar with legendary Chinese love stories, the Butterfly Lovers is simply the Chinese version of Romeo and Juliet, only much older in history. Great stories carry great inspirations, and The Butterfly Lovers Concerto – one of the most renowned Chinese concertos in the West – was created because of these stories. 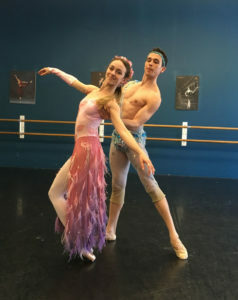 In Vancouver, Coastal City Ballet attempts to add another flavour to this beautiful tale with choreography from Vancouver’s own Joshua Beamish, bringing ballet into a new epoch. Vancouver, a city with a profoundly Asian-inspired cultural atmosphere, has motivated powerful integrations of diversity and multiculturalism in its arts, providing a source of inspiration for many art creators. Co-organized by Ballet Productions Canada Society (BPCS) and Asian-Canadian Special Events Association (ACSEA), LunarFest premieres the new ballet work, The Butterfly Lovers as one of the highlights celebrating Lunar New Year.” ACSEA has always been committed to initiating the interaction between cultures and communities. 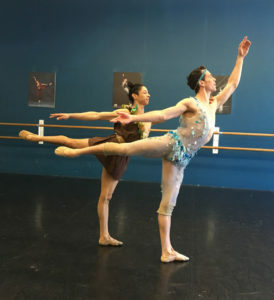 Vancouver is the perfect city to take that leap,” according to Charlie Wu, Executive Director of ACSEA.” Our community needs more attempts to create a greater possibility of new cultures.” The lead dancers for the work are Thys Armstrong of Dutch descent and Yoko Kanomato of Japanese descent. Coinciding with the Lunar New Year celebration, Vancouver will also feel the vibe of Valentine’s Day. 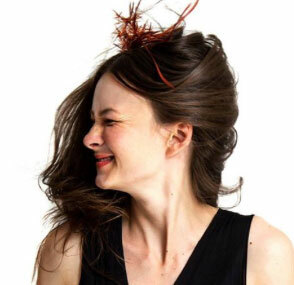 Presenting on the same stage will be The Love Stories by German choreographer Irene Schneider. The audience can get a taste of the clear contrast in expressing love, between the more explicit methods of Western culture and the more subtle ways of showing affection in the East. The show begins at 7:30 pm on February 16 at The Vancouver Playhouse. January 14, 2pm we open our door to feature the Great War sketches from the famous German typographer Rudolf Koch. It is the first time that theses sketches are shown outside Germany. We have the German consulate as guests and there will be sausages and pretzels provided by Arctic Meats. 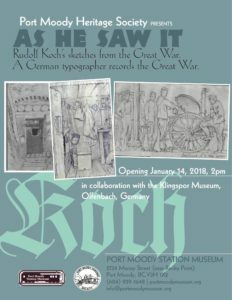 January 14, 2pm the Port Moody Station Museum is holding the exhibition opening for Rudolf Koch As he Saw it. The museum is proud to have arranged the first first North America showing of the Great War sketches from the famous German typographer R Koch. For the first time ever the museum will exhibit 40 drawings; which Koch created in the trenches of the Great War. went to war at the age of 40. In his own words he felt it was wrong to draw while his comrades were fighting, hence all his drawings were made behind the lines and did not depict fighting. food or returning from the work on a trench. would later find its way into his botanical books. Koch ever open to creativity, appreciated the well constructed Russian defence systems; rather than seeing them only as an enemy, he acknowledged a broader perception. After the war Koch set up the Offenbach workshop; a group dedicated to the promotion of art and craftsmanship. Koch carved the metal blocks directly to create his typeface Neuland. Among the many books he produced; his two very important works were on Signs and Christian Signs. ancient runes, to astronomical and religious signs. enthusiasts who delight in fine drawings and the conversations that arise from the interaction.The sketches are on loan from the Klingspor Museum in Offenbach. A museum dedicated to typography and book design; as such these drawings are interesting to any designer who is curious or looking into the genius of Koch; who created many typefaces and was an expert calligrapher. Koch’s amazing collection of signs; as per his wishes, were intended to be free of copyright and a source of inspiration for other designers. In this spirit of creative brotherhood; ARION Press in San Francisco and P22 Type Foundry in Buffalo, USA have allowed the museum to reproduce some of the exquisite materials. Coquitlam. Printing services were subsidized by Alliance Printing in Coquitlam. To see this poster full-size, click on it once, which will take it to the media gallery, then click again. Copyright for picture: All photographs and text on the Letterform site are original. You are welcome to share images for non-commercial purposes, provided you credit Letterform Archive and link to letterformarchive.org. 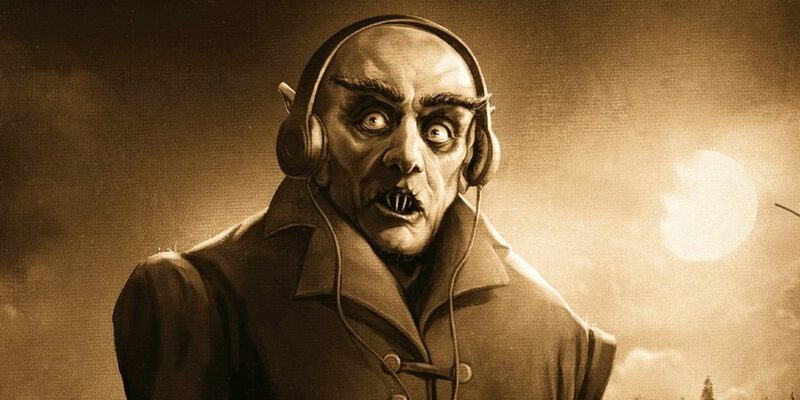 Any copyright in the works represented remains with the copyright owner(s). Families often look for magical activities during the Christmas Season that will allow them to be inspired, entertained and will work for all ages. “Seasons, a Magical Musical” fits the bill. This show, which contains an inspirational, yet dramatic story about a chance encounter with a magician (Chow) becomes the turning point in the life of our central character. She and the once mighty wizard take on new beginnings as they progress through the Seasons of Life together – from Spring, re-discovering magic and wonder, to Summer, enjoying and being amazed by illusions & creations, to Fall, fine tuning the magic they know & expertly sharing this with others, and finally to Winter, celebrating their astonishment and joy of life. Vancouver composer Wendy Yau Sum Cheung’s childhood dream when she first saw Phantom of the Opera, was to one day produce her own Broadway style musical. Vancouver magician Rod Chow’s childhood dream when he first saw a lavish magic production show in Las Vegas with his parents, was to one day star in his own. 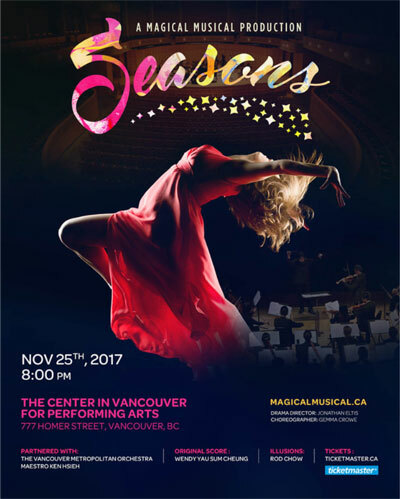 Today both Cheung and Chow’s dreams have come true as they prepare for the World Premier of their original production: SEASONS – A Magical Musical at the 1,800 seat Centre in Vancouver for the Performing Arts on November 25, 2017. “We are so proud that Vancouver will be the first to experience our unique merging of live orchestra, choreographed dance, epic inspiring story and stunning Illusions, integrated into one spectacular production”, says Cheung. 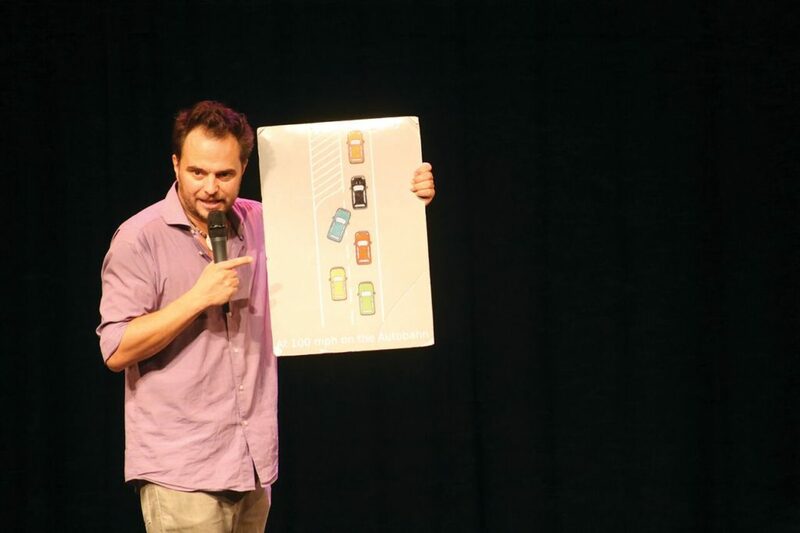 Sold out at festivals worldwide since 2011, 5-Step Guide to Being German is award-winning German comedian Paco Erhard’s comical mission to set the record straight about his “charming, crazy mishap of a country”. In 2017, 5-Step Guide to Being German ﬁnally comes to Vancouver. Written as a response to British people’s stereotypes about Germany, 5-Step Guide to Being German delivers “an extremely clever analysis of the modern German psyche” (Independent Daily, AUS) that is “side-splittingly funny and violently politically incorrect” (The Argus, UK). The show was nominated for the Fringe World Best Comedy Award in 2013. Paco Erhard shows us the Germany behind the scenes, as he self-ironially deals with topics as varied as German bluntness (“we’re not rude, we just value honesty more highly than other people’s feelings”), hilarious Autobahn dilemmas, the truth about lederhosen, and how it feels to grow up with Germany’s horrible past. Since then, he has toured the globe as a stand-up comedian, performing in English, German and Spanish. He has written on Germany and Europe for the Irish Times, authored an award-winning academic paper on cultural identity, and appeared on BBC One and many other international TV & radio stations, as a comedian and expert. If you want to understand Germany and your German friends and family better, see this show. Hello. My name is Karin Kunzo and I am a photographer living in Vancouver. I moved here from Berlin and I am currently finishing my Masters at Emily Carr University. I am working on a project that I would need some help with. I am searching for people that were born in Germany. The idea is to combine a portrait with a yearly salary earned by that person. This is a social critique, commenting on the absurdity of not being able to discuss one’s salary that I have experienced while living in Germany. I would be most grateful for any help. I focus on social critique. I make concepts with social impact. My models are always real people. I focus on building relationships with people, collaborate with them in order to convey something about our society. You can see my project, Girl in the Mirror, where I work with women in public bathrooms, while they are looking at themselves in the mirror. This project deals with the themes of social pressures put on women to look beautiful. The project would be shown in my university and may be published in a photography publication. Karin is a photographer and a photo editor, who is deeply interested in social structures. Her work explores the way individuals fit in with the expected social norms of everyday situations. Her projects often deal with themes of judgment, dissatisfaction, vulnerability and strive for perfection. Her projects often employ the stranger as the subject. Karin finds her inspiration in empirical research and exploring one’s vulnerability by backpacking through the Australian outback, going on a silent meditation retreat or walking across Portugal. Her work got published in several publications which include Le Journal de la Photographie, Dodho Magazine and LensCulture.